As part of their year-long study of New Jersey, Fourth Grade students at All Saints Day School enjoyed seine fishing and other hands-on experiences during their field trip to Sandy Hook. Gov. Phil Murphy announced the final alignment of the Rebuild By Design project, which will protect parts of Hoboken, Jersey City, and Weehawken from flooding caused by storm surges. The project –funded with $230 million from the U.S. Department of Housing and Urban Development – will be constructed along Weehawken Cove to the north, and in and around NJ Transit’s Hoboken Rail Yard, located at the southern portion of Hoboken’s waterfront. The project calls for construction of flood structures and storm water control systems to protect areas vulnerable to flooding. The southern alignment is a “middle ground” between the two alignments considered in the feasibility phase. It was chosen after a review of the project’s budget and federally-mandated 2022 completion deadline, as well as discussions with NJ Transit and local officials. The option selected will protect the NJ Transit’s Maintenance of Way building, parking areas and other infrastructure without permanently removing any tracks from service. This option will also reduce the visual impacts of the structure on Observer Highway and provide a redevelopment opportunity in the area. The DEP is continuing to work on designing the project, with construction expected to begin in early 2020. The United Synagogue of Hoboken at 115 Park Ave. held a memorial vigil on Monday, Oct. 29, in memory of the 11 people killed in the Tree of Life Synagogue in Pittsburgh, Pa. on Oct. 27. According to reports, Robert Bowers, age 46, of Baldwin, surrendered to authorities and faces 29 charges including 11 counts of using a firearm to commit murder and multiple counts of obstruction of the exercise of religious beliefs resulting in death, and obstruction of the exercise of religious beliefs resulting in bodily injury to a public safety officer. On Oct. 26, the Hoboken Historical Museum’s annual Masked Ball gala at the W Hotel raised $50,000, thanks to the efforts of many volunteers and donors. More than 200 guests gathered to celebrate the good work the Museum does in the community, and party with friends and neighbors. The Masked Ball raised funds through a combination of ticket sales, sponsorships, generous donations to support the Museum’s next exhibition, “Greetings from Hudson County: Then & Now,” along with vigorous bidding in a combination live and silent auction of unique travel, dining, entertainment, and other prizes. This year’s special guest emcee was Hoboken’s own Marci Rubin of News 12 New Jersey, and magician Tod Buchanan wowed the crowd with his sleight of hand performances, while the dancers of Believe Ballroom Dance Studio showed off some fancy dance steps. The goal of the auction was raising money for the Museum’s next exhibition, “Greetings from Hudson County: Then & Now,” which opens January 27, 2019. It will feature vintage postcards and an augmented reality app that allows visitors to compare “then” (early 20th century) with now. Proceeds will also support the associated education programs, events and collections. On Sunday, Nov. 11, one hundred years after the last shot in The Great War was fired, Douglas Taurel will perform his new play, “An American Soldier’s Journey Home,” at the Hoboken Historical Museum, 1301 Hudson St., at 4 p.m.
Tickets are $15 in advance, $20 at the door. For more information or to purchase a ticket go to the Museum’s website at www.hobokenmuseum.org. 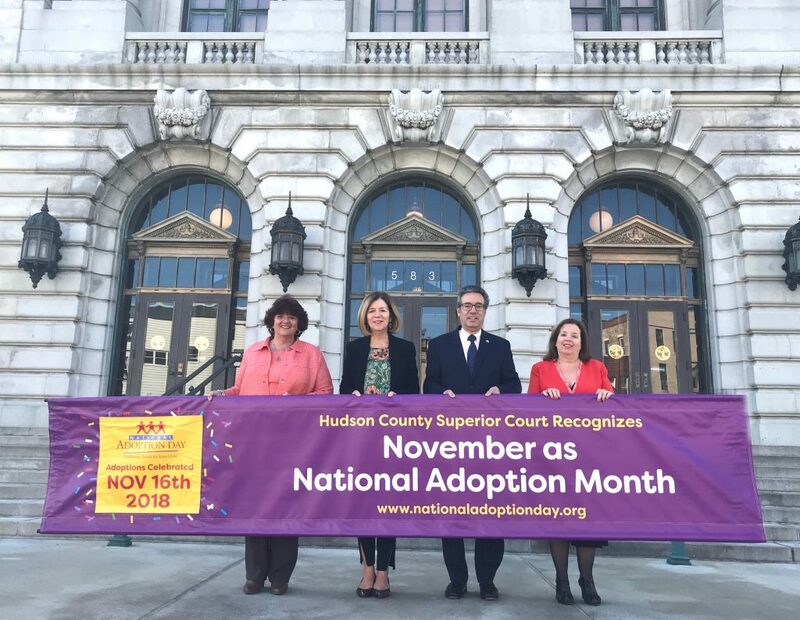 Hudson County Assignment Judge Peter F. Bariso Jr. unfurled a banner in celebration of November as National Adoption Month. He was aided by Superior Court, Family Division Judge Bernadette N. DeCastro (on his right), Beverly Savage, Executive Director of Hudson County CASA (on his immediate left) and Darlene Fusco, Hudson Bergen Area Director of DCP&P. The banner will hang for the month of November on the Hudson County Administration Building to raise awareness for the 117,000 children in foster care awaiting permanent homes. National Adoption Day will be celebrated on Friday, Nov. 16 in Hudson County when 15 children are expected to be adopted. This marks the 19th year that National Adoption Day will be observed throughout the United States and in that time nearly 70,000 children have found their forever homes.